The untreated patient with this anomaly is not expected to survive to adulthood, with 90% of all affected individuals dying in infancy. 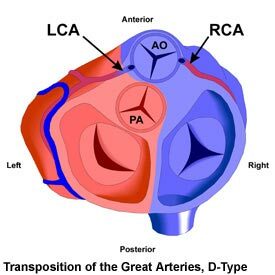 D-Type Transposition of the Great Arteries (TGAD) is associated with other defects about half of the time. These include ventricular septal defects (VSDs), coarctation of the aorta, coronary artery abnormalities, and left ventricular outflow tract obstruction. Any additional defects will affect symptoms and repair options. There is no heart murmur with TGAD unless caused by an associated defect. In the past, a permanent repair operation (Senning or Mustard atrial switch procedures) was performed some months later in which a baffle within the heart was created to direct blood flow from one atrium to the other. This effectively corrected the direction of circulation, but resulted in the right ventricle becoming responsible for pumping blood to the body tissues (systemic ventricle). This situation is not ideal because the right ventricle is not designed to withstand the workload involved for decades. Patients with a VSD and pulmonary stenosis as well as transposition may receive the Rastelli operation. In this procedure, a conduit is implanted, which transfers the job of pumping blood to the body to the left ventricle. However, this conduit will wear out over time and a series of re-operations will usually be necessary. The preferred surgical repair of TGAD, first described in 1975, is the Jatene Arterial Switch operation, usually performed in the first few week of life. This involves the dissection and reversal of the great arteries (aorta and pulmonary artery) near their roots, as well as the reimplanting the coronary arteries. This approach is superior to the atrial switch operations because it preserves the left ventricle as the systemic ventricle responsible for pumping blood to the body tissues, as in a normal heart. The long-term prognosis for patients who received the Mustard or Senning atrial switch operations is not as good as for those who received an arterial switch. Arrhythmias often develop over time, and are probably responsible for most cases of sudden death that occur (7-15% of all patients, with resuscitation possible in some cases). There is also the risk of right ventricular failure. Studies have shown that 90% of patients who received these operations survive for at least 10 years and 80% for at least 20 years, with sudden death being the cause of most mortalities. Mustard/Senning repaired patients are also at risk of pulmonary vein stenosis from scarring of the atrial baffle. Rastelli patients are also subject to the development of arrhythmias and sudden death. About one quarter will develop left ventricular dysfunction. Also, the implanted conduit will become narrowed (stenotic) over time and will need to be replaced approximately once every 10-20 years. The survival rate for Rastelli patients is not quite as good as for the atrial switch patients, with about 80% living for 10 years after the procedure and a bit more than half surviving for 20 years. The prognosis for arterial switch (Jatene) patients is very good. A study of 1000 patients showed that 88% survived for 10 years, with no further deaths between 10 and 15 years after surgery. Arrhythmias and heart block are rare, though the comparatively short time since this procedure came into use should be borne in mind. Some degree of dysfunction in the coronary arteries, left ventricle, pulmonary valve, and/or the aortic valve is somewhat more common, occurring in 5 to 25% of patients.